No obstructions. Hinged at cab rail for FullTilt action. Gull-wing latches secure tonneau without restricting cargo space. Extang engineering at it's best - revolutionary design allows entire tonneau to be instantly lifted and removed from frame with no tools. The L-Rail and Quick Release hinge system work together to provide an easy no-measure install and a flawless open and close action. Gas shocks are designed to be easily removed by hand using a ball and joint snap release. No tools needed. Leave your tonneau at home within seconds. 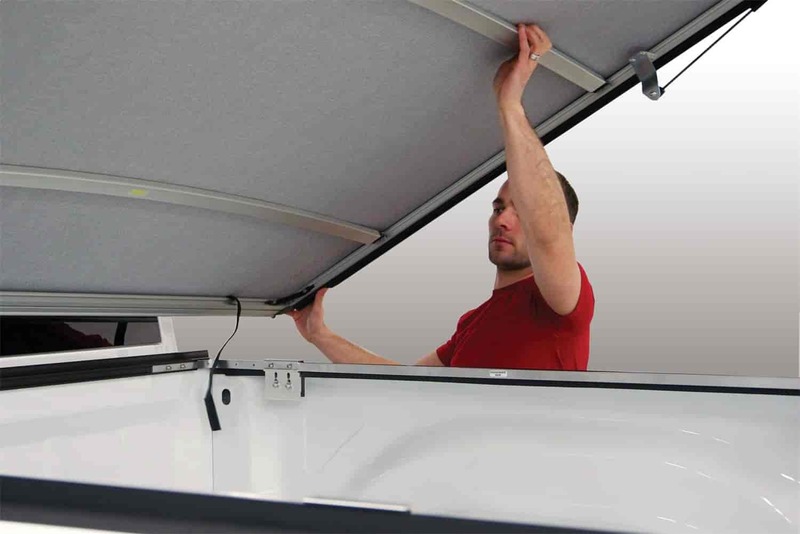 The FullTilt tonneau cover is available to fit with your existing tool box. Fits most standard tool box sizes. Perfeect fit with self-draining and sealing L-Channel. Perfectly sewn, tight fitting tarp with anti curl corners allows for extremely good looks in all weather conditions - an Extang tradition. Does Extang 38730 fit your vehicle?